With lot of clearing and a new fence, the transformation is underway! In the worm-catching years I struggled with countless lawnmowers – a ‘lawn’ that would not weather the scrutiny of any trade description, blessed as it is with random lumps and bumps, half a metal scrap yard (now safely dug up and recycled), some horrid bionic leaves that grow bulbs on bulbs and the most rampant hedge you wouldn’t wish for. Many hours of my life that I’ll never get back were invested in keeping the garden ‘under control’ and a fair bit of money spent on the odd plant (but I gave up after the Eric Cantona’s prodigy beheaded the rhododendron in two hours flat). It had truly been a love-hate relationship! But last year I used some of the time once invested in motherhood to harness some energy, engage a bit of brain and try to liberate the garden. It was never going to be a quick fix because there is so much of it. And despite harnessing and engagement, the grass and hedge still demand a degree of attention that frankly I could live without. Still, by the end of the summer I was committed to never having my nails manicured (wasn’t going to anyway) and happily puddling ‘round, ‘digging’ with a trowel because I am way too delicate to jangle all my bones hitting buried junk with a spade. And, if I do say so myself, decent progress was made. 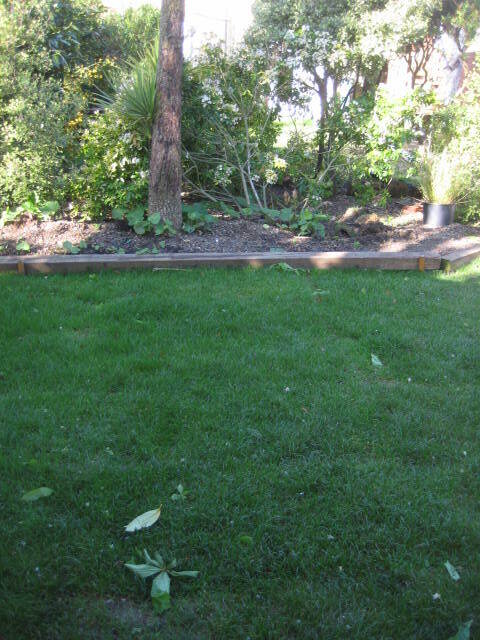 The weediest weedy bit was cleared and covered with weed control. Bark was unceremoniously dumped on it and a couple of lavender plants plonked in. Wow! They are so happy there — they have doubled in size. 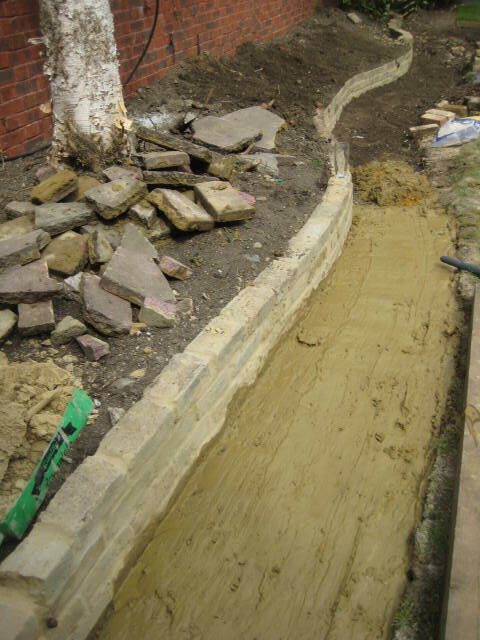 But the main bulk of my work (with my trowel) was the lumpiest bit of garden that the ‘horrible plants’ had overtaken. No word of a lie, their bulbs grow one on top of the other and form a ridiculous mat of impenetrable stuff. Still, I picked a good time when the soil was damp but not soaking to have a go at them and slowly but surely they got green recycled out of my garden. And then a Eureka moment! My biggest ‘Grrr’ in the garden is not so much the work but the difficulty of doing it alone. Silly branches just out of reach necessitating some sort of acrobatic endeavour to reach and cut them, all sorts of wonderful fencing that would require more acrobatics and the firm belief that no one could YouTube me fighting with them, lovely paving stones that just shout at me to leave them in the shop because I can’t lift them and I love my toes. You know the stuff, the list goes on. And then the question of the technical know-how and the skill to make things out of bricks or stones and concrete, Ewwww. My two will tell you that you could artex a ceiling with the semolina I make because of the lumps, so there was no way Mrs. Weedy-arms was going to try her hand at mixing stuff that is dusty and goes all sorts of random, wrong places. No, sir. The whole principle of the sleeper worked because they are straight and natural, provide natural divides in the wonky garden and can also host a flourish of colour when you plant things in them. Eureka! 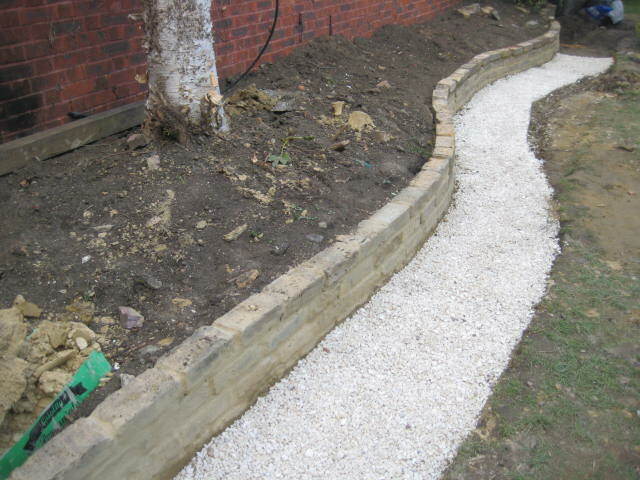 The garden is now sort of divided into four areas and while only three of them are de-bumped and level, there is a space that is flat and gravelled. It’s modest but it’s mine. This space is fab late afternoon and into the evening with some candle pots and good company! Working at a modest pace, with a very small tool and being prepared to be the tortoise not the hare helped the process. So did working out what I could manage on my own in my non technical, not strong but prepared to try, enthusiasm. Somehow that Eureka transformed my view of the garden, from a place of thankless graft to a place of exciting manageable plans, albeit with a hearty helping of hard graft. I don’t mind that, but I wish I had taken some picture before I started. Dex the digger, brought his mate Luke to work one day saying that he would share his wages with him, but needed, or perhaps he said wanted, someone else to work with, I can’t quite remember. Well, pleased that the work would get done quicker, I insisted that Luke should be paid equal wages too. Seeing two grown men working for half wages did not sit right with me. However, over the next few days, it did seem to be taking a long time to do these last bits of garden. work Then the rain came, and came and came and came, so that when Dex and Luke came to work, they had to take shelter in the shed at frequent intervals. I was away for 3 days and left them to work, as I had done before when Dex worked alone. This time on my return however, there definitely did seem to be less work done than when Dex had been alone. Did I smell a rat? Had it rained that much? Was I getting paranoid? I pondered over the weekend, and decided to ask Dex to come to work early on Monday, without Luke. I would then work with him most of the day myself. I rang on Sunday to arrange this, but couldn’t speak to Dex directly, leaving a message instead. Early Monday came and went. Dex did arrive late morning with Luke, full of apologies. Unfortunately his personal life had fallen apart that weekend and he had to travel from Kent that morning, from where he was now staying. The cost was outrageous and accounted for most of his earnings that day. We all three worked in the garden till early afternoon and got most jobs finished and the place looking tidy. The new turf had taken well and loved all the rain. 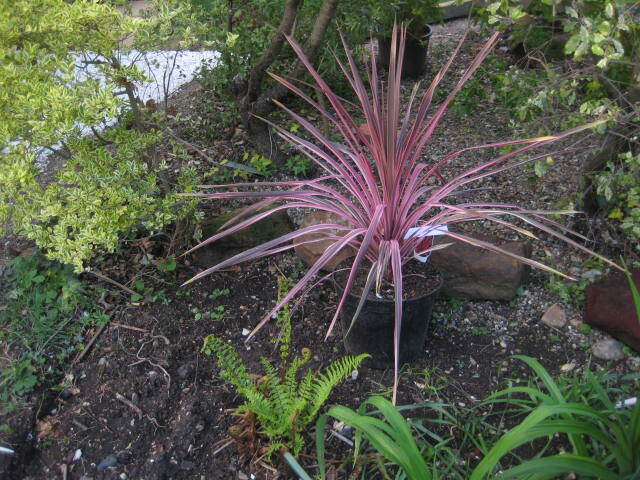 I had bought just the Cordyline I wanted and found the perfect place for it. But that was the last I saw of Dex and was left feeling very sad for him. I left thinking about the rest of the garden for another time. I am over the worry of it now and on the downhill stretch. There were enough bricks reclaimed to remake the wall, and it looks great in light yellow colours of the old London Stock bricks that the house is built in. The path beside it we started in the crazy paving that was down before. However, I was using them only because they were there. I don’t really like the look of crazy paving in a Victorian house setting. The Dex came up with a plan. He had only just started and the cement was still wet. 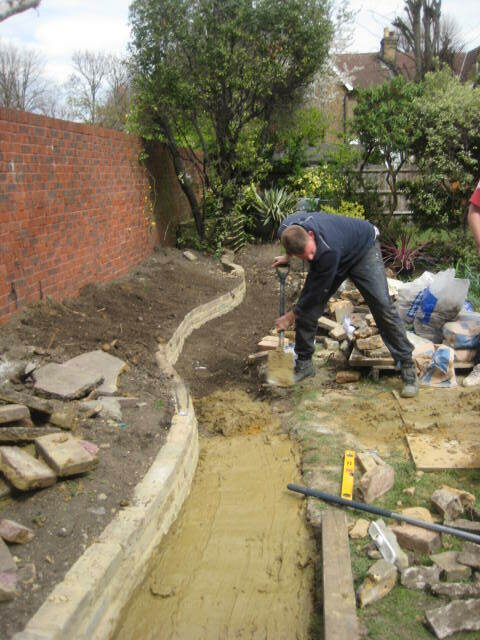 It takes quite a time to fit the jigsaw puzzle together and we reasoned that laying concrete was quicker. Dex’s master plan was to inlay white stones in the cement. I was due to rush to Sussex on a school pick up run in an hour, but chose to rush to the local Jewsons to buy more cement and white stones. I couldn’t quite picture the white path, but took a chance that my taste and Dex’s would match. 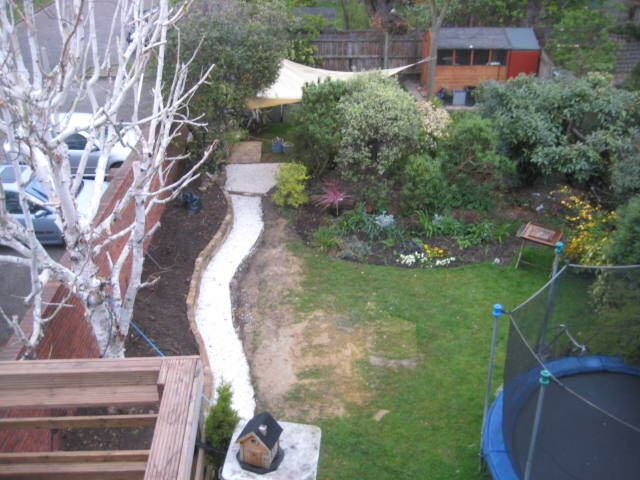 I flew down to Sussex, but had a bad night there imagining the path to look like a long trail from the top of a grave. The next morning a friend commented that that he had never seem a garden makeover with a graveyard theme….that helped. But it was lovely and I am so pleased. It still has to have a resin coating so I think it will wear well.